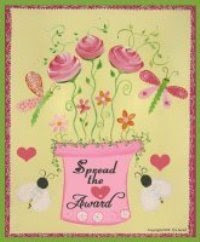 My blogger friend Zvonko gave this award to me. I truly appreciate it my friend. Lets us all spread love not hate. Let us learn to love one another despite our differences. In race, religion, beliefs and upbringing. A world built on love is a much happier world to live in. 1. Copy the badge and put it on your blog. 2. Link back the person who passed you this award. 3. Spread the love to at least 10 or more bloggers. Now I am passing this award YOU. Please grab it guys and spread your love to each and everyone.